The HTML Select tag is ideal for presenting a list of fixed category data, but often times you need to add a new category. Suppose we want to add the genre "Opera" to the categories in our database? In this section, we will use jQuery UI to add a dialog box we can use to add a new category. The image below shows how the UI will present in the browser. 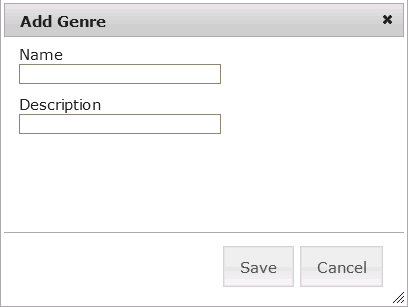 When a user selects the Add New Genre link, a pop-up dialog box prompts the user for a new genre name (and optionally a description). The image below show the Add Genre pop-up dialog. An AJAX call posts the data to the Create method of the Genre Controller, which saves the new genre to the database and returns the new genre information (genre name and ID) as JSON. 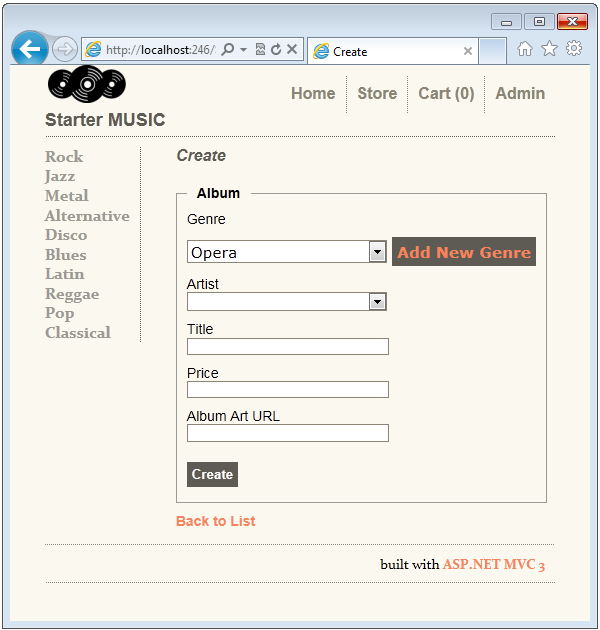 In the image below, Opera was added to the database and selected in the Genre drop down list. Run the application and click on the Add New Genre button. 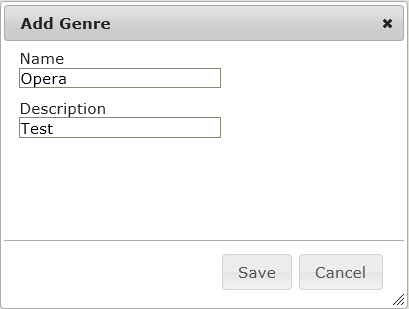 In the Add Genre dialog box, enter Opera in the Name input box. Click the Save button. 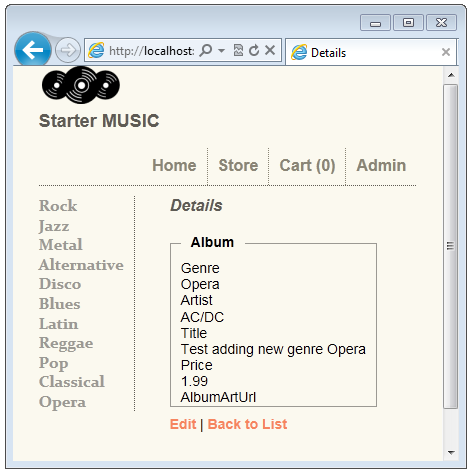 An AJAX call creates the Opera category and then populates the dropdown list with Opera, and sets Opera as the selected genre. Enter an artist, title and price, then select the Create button. If you enter a price less than $8.99, the new album will appear at the top of the Index view. Verify the new album entry was saved in the database. Try creating a new genre with only one letter. The following code in the Models\Genre.cs file sets the minimum and maximum length of the genre name. 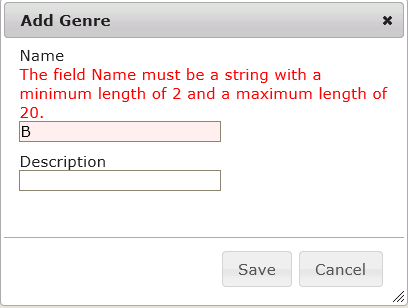 Client side validation reports you must enter a string between 2 and 20 characters. Examining How a New Genre is Added to the Database and the Select List. Open the Scripts\chooseGenre.js file and examine the code. The second line uses the ID genreDialog to create a dialog box on the div tag in the Views\StoreManager\_ChooseGenre.cshtml file. Most of the named parameters are self explanatory. The autoOpen parameter is set to false, selecting the Create Genre button will open the dialogue explicitly (this is described latter on). The dialog has two buttons, Save and Cancel. The Cancel button closes the dialog. The following code shows the Save button function. The var createGenreForm is selected from the createGenreForm ID. The createGenreForm ID was set in the following code found in the Views\Genre\_CreateGenre.cshtml file. The Html.BeginForm helper overload used in the Views\Genre\_CreateGenre.cshtml file generates HTML with an action attribute containing the URL to submit the form. You can see this by displaying the create album page in a browser and selecting show source in the browser. 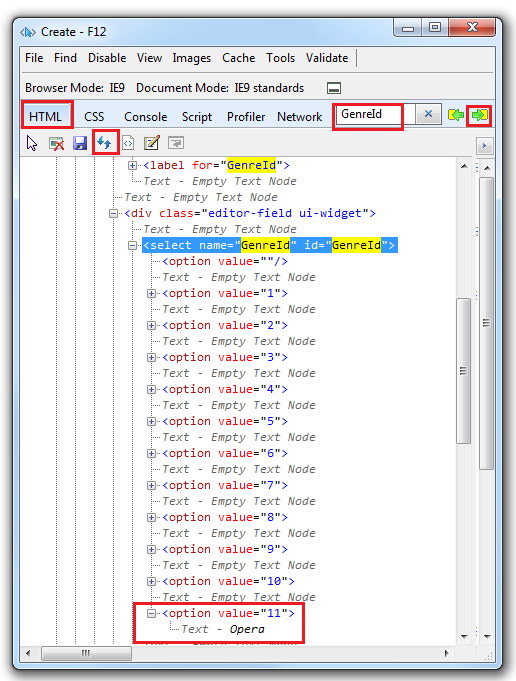 The following markup shows the generated HTML containing the form tag. In the search box, enter GenreID. Expand the last option value. The following code in the Scripts\chooseGenre.js file shows the how the Add New Genre button gets connected to the click event, and how the Add New Genre dialog box is created. // The createGenreForm is loaded on the fly using jQuery load. The load method creates and opens the Add Genre dialog and calls the jQuery parse method so client validation occurs on data entered in the dialog. In this section you have learned how to create a dialog that can be used to add new category data to a select list. You can follow the same procedure to create UI to add a new artist to the artist select list. This tutorial has given an overview of working with the ASP.NET MVC HTML helper DropDownList. For additional information on working with the DropDownList, see the addition references section below. Please let us know if this tutorial has been helpful.